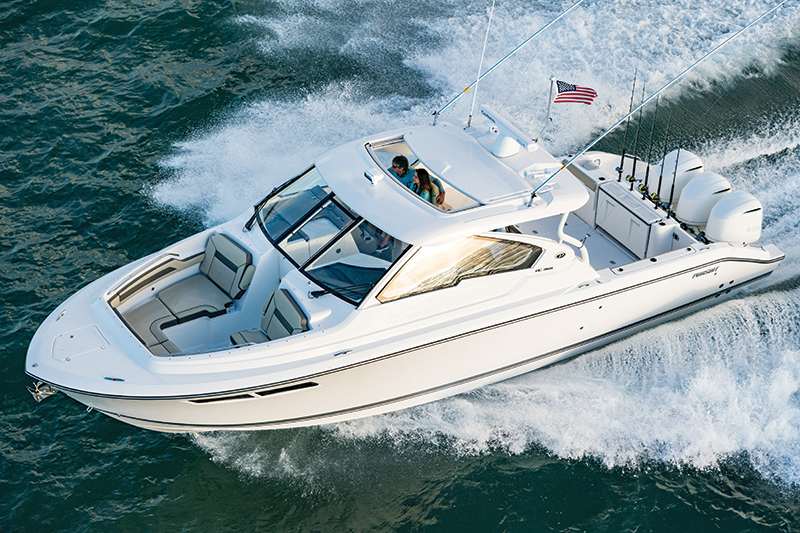 It’s a dual-console, outboard-powered, bow-seat-having weekend cruiser and fishing machine. All this because Pursuit really got it right with its new entry, the DC 365. The DC is short for dual console, and both consoles are usable insomuch that each contains a cabin under it. And there are numerous other surprises that make this a truly versatile platform. What’s most notable about the console/cabin combo is that the DC 365 also features open bow seating. Pursuit has performed an engineering feat to blend cabins and bow seating into one hull form. 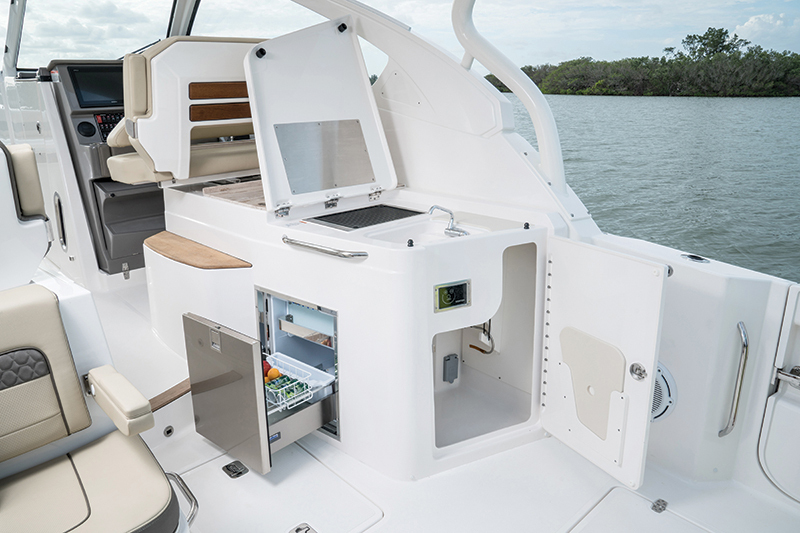 The starboard helm console has a hinged access door with an actuated top panel that slides back as the door opens, creating headroom for folks going below. 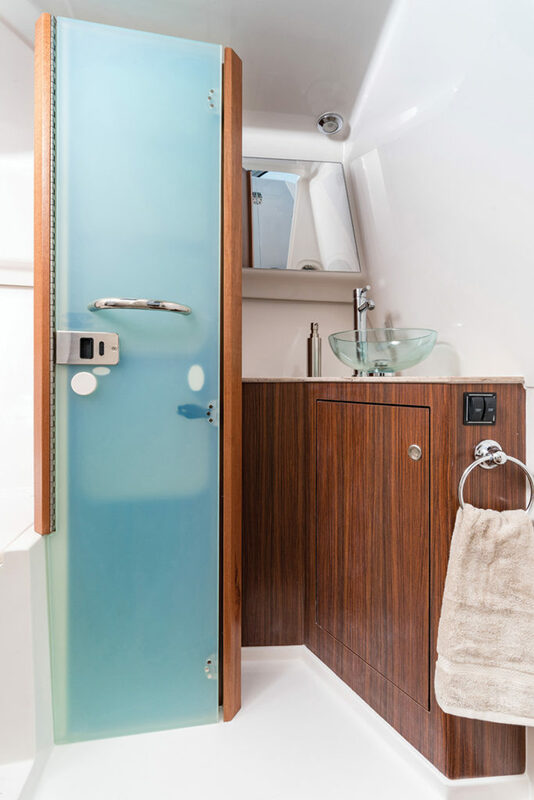 What’s revealed is not just a head compartment, though it is complete with a glass basin sink, a vacuum-flush head with a 22-gallon holding tank, a vanity and a skylight. It also has a toilet/shower stall whose bi-fold door doubles as the full-height linen closet door. A six-gallon water heater is standard. In the port console is a cabin, with both a forward and aft berth area that make it perfect for a quick snooze or an overnight stop on the hook. 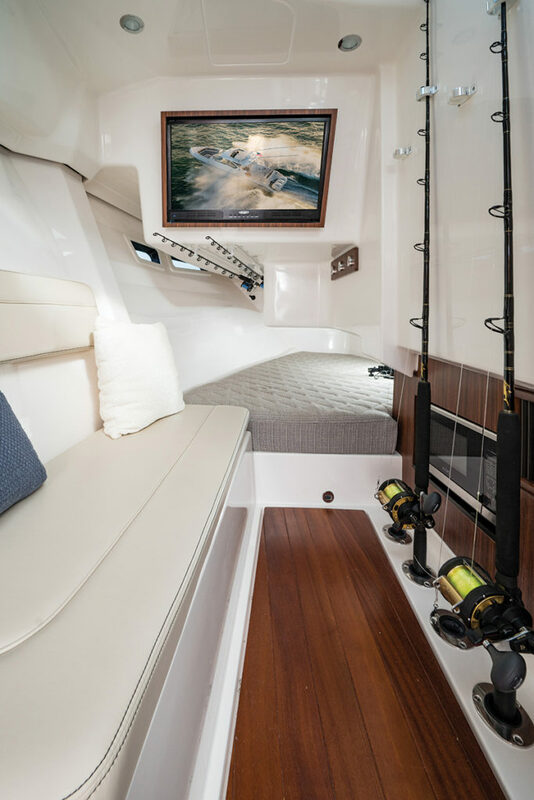 Pursuit fully maximizes the space by adding a leather bench settee, a 28-inch LED TV, vertical and horizontal rod storage, a cedar locker, reverse-cycle heat/AC and hull-side windows. There’s even a microwave oven. My immediate thought upon seeing the bow seating for the first time was that the DC 365 is just another bowrider, but I was soon corrected. According to David Glenn, Pursuit’s marketing director, who was with me for the test, Pursuit prefers to refer to it as “luxury lounge seating.” (Ed. note: Since Serio tested the boat, Pursuit was sold to Malibu Boats Inc. by former owner S2 Yachts.) It’s more than just a few pads in a circle. Pursuit created a luxury oasis, with generously oversized forward-facing lounge seats that feature armrests, drink holders, a 12v outlet and two USB plugs. Storage under the starboard seat includes dedicated dive tank space. The seats wrap around the front, and a center filler cushion can create a giant sunpad. Cushioned backrests ring the area for seating in any position. The Pursuit DC 365 can be almost anything an owner wants it to be. 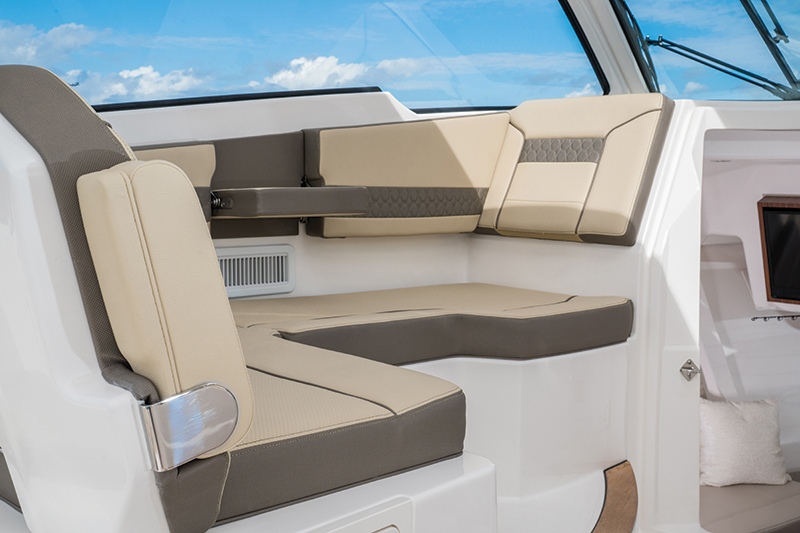 As a cruiser, the cockpit offers amply padded fold-down bench seating across the transom and along the port side. 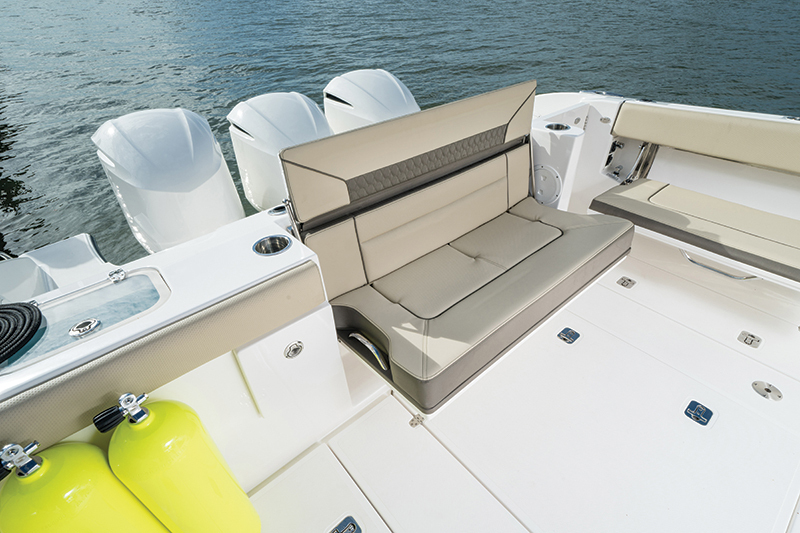 An aft-facing bench straddles the line between cruising amenity and fishing feature. It conceals a freezer box in the base and tackle drawers behind its flip-down backrest. In-deck storage and fishboxes keep the catch fresh and supplies dry, further enhancing the crusin’/fishin’ mission. The seats fold up to create a roomy fishing deck that includes four gunwale and five transom rod holders, a 28-gallon transom baitwell and a transom door to facilitate pulling in the big ones. A molded entertainment center to starboard has a hot/cold sink, a Corian counter, an electric grill, a cutting board and a refrigerator/freezer, so the day’s catch can go from hook to cook. Beneath a center deck hatch are an 8 kw Fischer Panda diesel generator with a 23-gallon tank, strainers, batteries, fuel filters and dedicated spaces for the swim ladder, stern anchor and cockpit table. 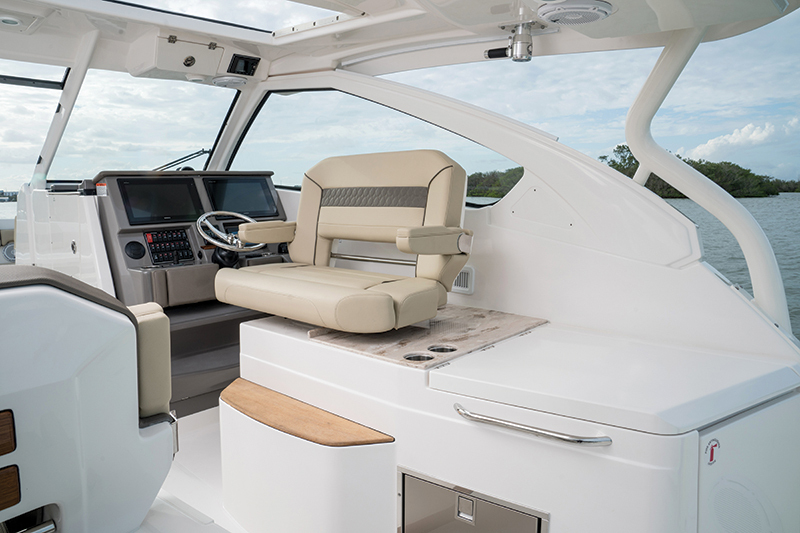 Up one step is the helm deck where Pursuit makes the details count, with special attention paid to the settees’ diamond stitching, side padding, and armrests. A combo bench/lounge seat is situated to port, and across from it is a twin bench helm seat with a bolster and armrests. It swivels 90 degrees, so occupants can join the group or take in a new view. A built-in footrest adds comfort. Sitting at the starboard console seat, I became aware that this is a thinking man’s helm. First, the molded fiberglass helm unclips and tilts to provide easy access to wiring and the rest of the behind-the-scenes items. 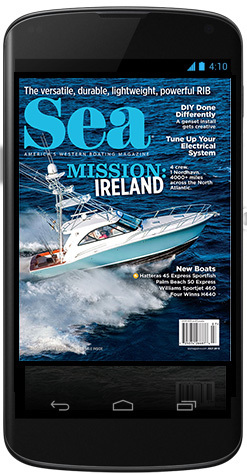 There’s room for twin 16-inch Garmin GPSMAP 7616 multifunction displays — Pursuit prefers the Garmin array of electronics, but buyers can choose their own — a Yamaha engine display (all three motors on one screen), a bank of 24 rocker switches, a bow thruster control and more. The twin helm seat is bolstered for maximum comfort. Included is a molded-in footrest that folds down to create a standing platform for height-challenged captains. A couple of pads on the face of the helm help to protect one’s knees from banging when operating in heavy seas. Good thinking. Triple Yamaha F300 powerplants are bolted to the Pursuit DC 365’s stern, behind the transom and out of the way of the work area of the cockpit. 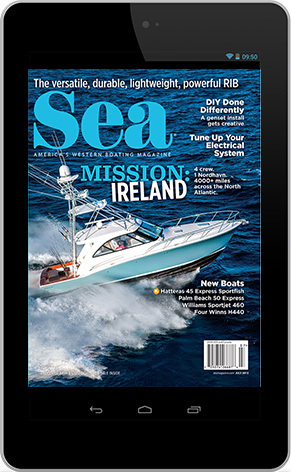 Each outboard produces 300 hp, and those 900 hp offer instant response and impressive speed, even when pushing the 17,000-pound fiberglass hull. Running inshore, we took several reciprocal speed readings, which revealed that this package can get out and back at a leisurely cruising pace or at breakneck speed. Dialing in at 2500 rpm, we tooled around at 12.2 mph, at which point the Yamahas were burning a combined 16 gph. Pushing the F300s to 4000 rpm yielded 35.2 mph and 34.5 gph. Wide-open throttle, 5800 rpm, delivered an exhilarating ride. The boat reached 52.8 mph while the engines burned a combined 78.3 gph. At any speed the ride was dry and comfortable, and we maintained good visibility at the helm. Pursuit’s hull design includes two lifting strakes per side — one goes halfway back and the other almost the full length — and wide chines, which operate in concert to keep spray at bay and add stability. Noteworthy is the invert on the V, which creates a flat area at the transom that adds top-end lift and speed while delivering clean water to the center outboard’s prop. Having been on several Pursuit models over the years, I try to be a bit more critical and look for issues on its new boats. I thoroughly examined the Pursuit DC 365 from stem to stern and really couldn’t find anything with which to take issue. Pursuit continues to build its line of Dual Console models as well as its Offshore, Center Console and Sport/Sport Coupe lines with a focus on innovation and comfort, dedicated to building the finest crafts in their class. Other niceties on the DC 365 include an integrated hardtop/window frame with a sunroof and 3¼-inch tube framing that adds rigidity and style to the structure. Access from deck to bow is via a windshield walkthrough that offers a centerline pathway. 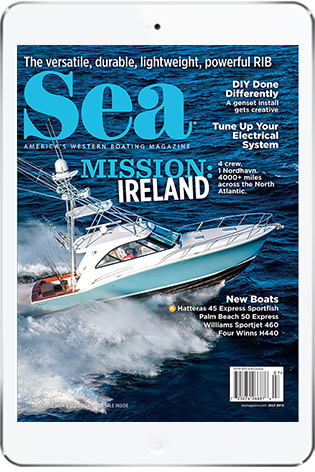 Standard features include a starboard-side boarding gate with a clip-in boarding ladder, a 3 hp bow thruster, Lenco trim tabs, a center window and a bow door with a floor drain. Buyers can add outriggers, an electric retractable cockpit sunshade, a Yamaha Helm Master joystick controller, autopilot and other options that create a tricked-out ride. Something the Pursuit DC 365 has that every boat should have — in the event someone falls overboard, especially if alone — is an emergency four-step telescoping ladder that pulls out of the hull’s portside transom just above the waterline. The bracket pulls out and folds down, with four foldout steps on either side that are easy to hold onto until help arrives. Grabbing the outboards and getting one’s legs near the props is never a good idea. This makes so much sense. Keeping all of this together is a vinylester resin-infused, hand-laminated hull with an infused structural stringer grid system and a beefy five-ply transom with Pursuit’s patented Transom Reinforcement Grid. Pursuit is so sure of the DC 365’s construction that it includes a five-year hull, deck and blister warranty. With all this packed into a 37-foot hull, the boat’s profile could be clunky and overstuffed. But the builder’s designers have ensured the Pursuit DC 365 is as sleek at the dock as it is blowing through an inlet. A raised forward sheer remains unbroken until the transom, generous freeboard accounts for cabin space and delivers a dry ride, and a raked windshield couples with tapering side windows, giving the DC 365 a chopped appearance that is indicative of a lean, mean cruising/fishing machine. LOA: 37 ft., 11 in. Draft: (motors down/up) 3 ft., 1 in./2 ft., 2 in. 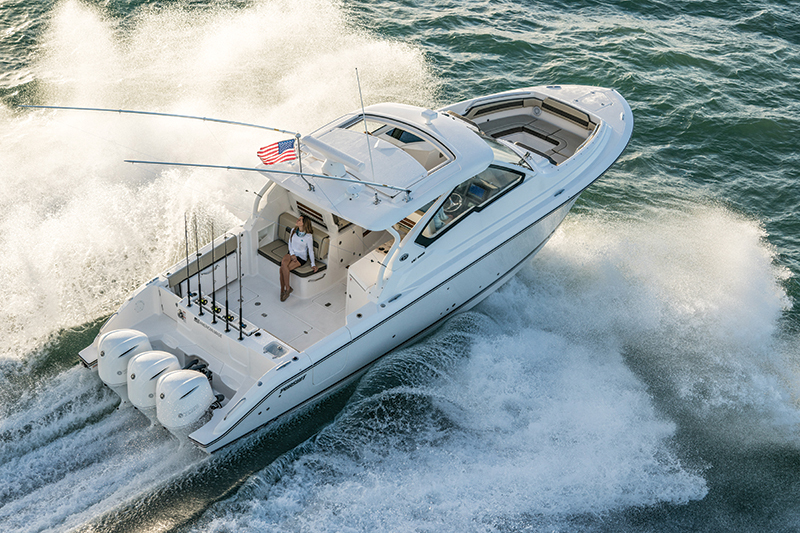 Pursuit white gelcoat, integrated transom platform for outboards, one-piece deck and cockpit liner, anchor windlass, plow anchor, transom walkthrough, custom upholstery, Lenco tabs, rod holders, hardtop sunroof, windshield, Teleflex steering, 8 kw generator and more. Yamaha Helm Master, hull color selections, 16,000 Btu AC, refrigerator, teak table, side curtains for hardtop, covers, Garmin electronics package, spotlight and more. This entry was posted in New Boats, Boat Tests New and tagged pursuit boats, yamaha f300, dual console, pursuit dc 365 by Mike Werling. Bookmark the permalink.